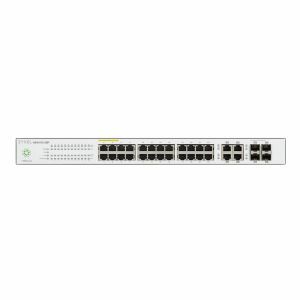 The Zyxel Nebula NSW100-28P Cloud Managed PoE Switch is a 375 W high power budget layer-2 switch designed to be managed completely from the Nebula cloud. The cloud-based management interface provides site-wide configuration and monitoring of all ports, which allows multiple switches to be configured at the same time with a single click over the Web. The NSW100-28P brings many benefits of the cloud management systems, such as simplified configuration, easy management, site-wide visibility and real-time control for speedy branch network deployments into networks. Advanced settings such as user friendly ACL, VLAN-based QoS and PoE scheduling significantly improve the efficiency of network management.